Emulator tools - converting between real floppy discs and disc images, as CPCTRANS / PCWTRANS do under DOS. Filesystem utilities - CPMTOOLS is configurable to use LIBDSK, thus allowing the use of CPMTOOLS on emulator .DSK images. To do this, install LIBDSK and then build CPMTOOLS, using "./configure --with-libdsk". For CPMTOOLS 1.9 or 2.0, you will also need to apply this patch. Emulators - it is possible to use LIBDSK as part of an emulator's floppy controller emulation, thus giving the emulator transparent access to .DSK files or real discs. Bugfixes: Corrected various faults in the IMD file driver. Added a 'complement' flag to the recording mode, allowing support of disk images where all bytes are stored complemented. When converting to TD0 format, attempt to guess drive type (3.5" / 5.25") from drive geometry. When probing geometry on disc image files that do not record the data rate, prefer the rate specified in the boot sector. Fix for integer underflow issues in the POSIX / raw driver. The LDBS format has been updated to support round-trip compatibility with the further EDSK extensions. DSK, EDSK, ApriDisk, CFI, IMD, JV3, CopyQM and TeleDisk drivers have all been rewritten to use LDBS for intermediate storage. dskform(1) can create a blank FAT12 filesystem when formatting. New utilities: lsgotek(1) lists the disc images present on a Gotek-formatted USB drive. dsklabel(1) can view or set the disk label on DOS, CP/M or Acorn DFS filesystems. Raw files, rearranged into logical filesystem order. .DSK files, as used in CPCEMU, JOYCE and other Sinclair/Amstrad emulators. MYZ80 hard drive image files. .CFI (Compressed Floppy Image) files, as created by FDCOPY.COM under DOS. 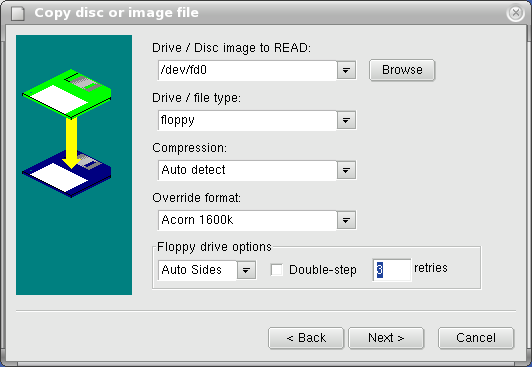 The Linux floppy drive (supports CPC System and Data formats, which the standard "Raw file" driver does not). The Windows 3.x/95/98/ME/NT/2000 floppy drive. The DOS floppy drive (via the PC BIOS). rcpmfs - a backend that makes a Unix/Windows directory appear to be a CP/M disc image. Another instance of LibDsk over a serial line. Debian packages by Darren Salt. Packages for Fedora Core 2 and Redhat 9 by Ian Chapman. Lib765 is the floppy controller emulation from JOYCE, separately packaged. It is (in some sense) the reverse of LibDsk; it converts uPD765a commands into LibDsk API calls. It should come in handy if you're writing a PCW, CPC or Spectrum+3 emulator; if you want to use it in a PC emulator, you'll need to add features such as DMA. (v0.4.2) Increased buffer size to fix multisector reads on high-density disc images. (v0.4.1) Removed spurious references to LIBDSK_EXPOSES_DIRTY. (v0.4.0) Initial support for multisector reads. The Diskette Tools program is a GUI front-end to LibDsk. It doesn't do any more than the provided sample utilities, but it looks nicer. dsktool-1.0.5.tar.gz (38k): Source code - suitable for Linux, Windows and probably other platforms. Requires wxWidgets to compile. dsktool103.zip (1473k): Compiled version for Windows, including source code. AUXD is a server for CP/M, allowing drives from CP/M systems to be made available to LibDsk over a serial link. Two versions are included - a generic CP/M server, and one for Amstrad PCW/CPC/Spectrum +3 CP/M. auxd.zip (62k) - source code and compiled programs.